well I am not lov'n how the pic came out! So much better IRL oh well I have so much other stuff to do today and play with the broken cameras is not one of them!!! 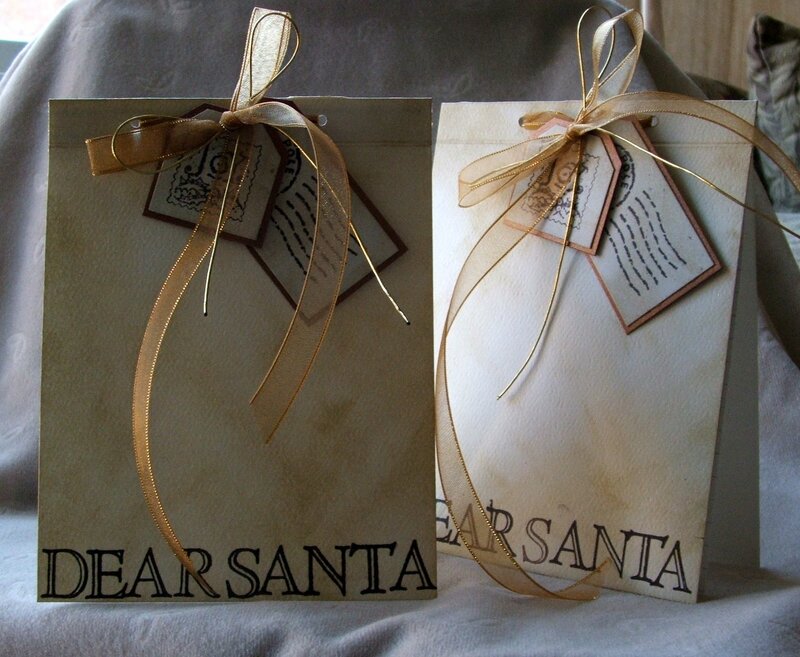 the two cards you see here are going to be sent to Santa ( in Lakeside OR. or my moms house) and jasmine and Ava get to wright what ever they want they do not have to show mom if they don't want to and that is okay ( I have ways Of seeing what they want) because if this keeps them believing in Santa for another year or two than I will be more than happy!!! 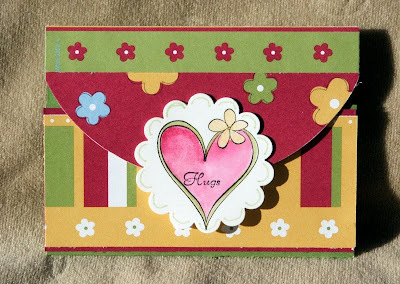 this is the card for today's CC142 it took a while to put together and kind of turned out how I saw it I got the idea for this card when I was taking a really bad stab at a no time to stamp bookmark cover no I will not post that it is going in the trash and I am going to try again most of the time I am not modest but I am so not into posting bad projects and really not when you get the idea from someone like Sharon!!! 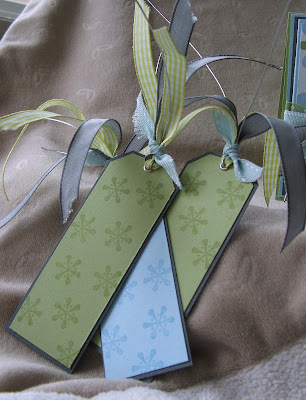 I do want to make them for teacher gifts and I am going to try again wish me luck!!! 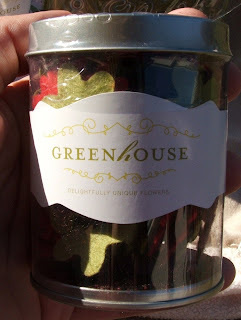 tell me what you think and thank you for stopping by my blog!!! What The Hollidays Are To Children!!!! the scroll on my card is the article below and the word window punch says "yes Virginia, there is a Santa Claus"
this is my all time fave time of the year even more so now that I have kids of my own!!! I enjoy cooking dinner for them, and watching them eat there pie (that we got at walmart) and having them tell me how it was the best part (stinkin kids)!!! 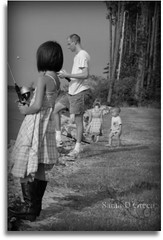 as long as they are happy it is all worth the effort!!! 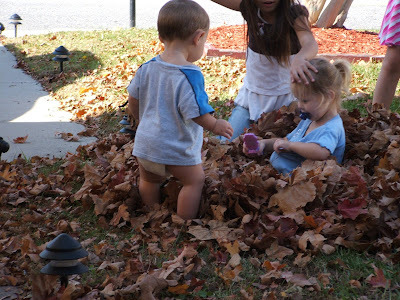 Jasmine Ava ans Henry played most of the day in the leaves in our front yard and they had a great time doing so, till I said it was time to bag them, Ava Quickly told me she wanted her nap that she never took. Henry took more leaves out of the bag than he put in, and Jasmine forgot that she had a job to do more than any child I have ever seen in my life oh well it got done (by me) in the end. 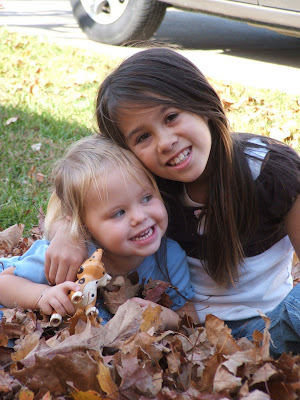 I love this picture of my two girls they look like they love each other and they would never fight (not so much) but is nice to have some pics. like this they are my little beauties!!!!! you can also see were Ava had played beauty shop on her own head in this picture!!!! 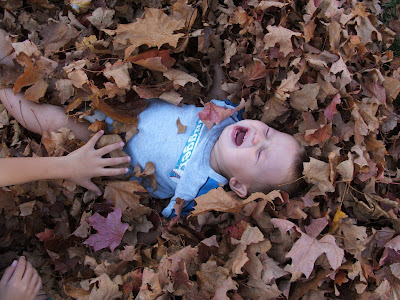 this is my little man and the girls thought it was funny to lay him down in the leaves and cover him so that you could not see him. As you can see he did not find it as funny as they did none the less he did not want to come in the house and ended up sucking it up and let his sisters treat him like the doll baby that he is and here Jasmine is trying to do the same to Ava who was way more willing that Ava!! thanks giving turned out great even though we did not get to spend it whit other family it was perfect with just my DH and my babies!!!!! this is some thing funny that I wanted to share with you someone sent me on my myspace page and I thought I would share with the blogg'n mommas out there!!!! If it is on, I must turn it off.If it is off, I must turn it on.If it is folded, I must unfold it.If it is a liquid, it must be shaken, then spilled.If it a solid, it must be crumbled, chewed or smeared.If it is high, it must be reached.If it is shelved, it must be removed.If it is pointed, it must be run with at top speed.If it has leaves, they must be picked.If it is plugged, it must be unplugged.If it is not trash, it must be thrown away.If it is in the trash, it must be removed, inspected, and thrown on the floor.If it is closed, it must be opened.If it does not open, it must be screamed at.If it has drawers, they must be rifled.If it is a pencil, it must write on the refrigerator, monitor, or table.If it is full, it will be more interesting emptied.If it is empty, it will be more interesting full.If it is a pile of dirt, it must be laid upon.If it is stroller, it must under no circumstances be ridden in without protest. It must be pushed by me instead.If it has a flat surface, it must be banged upon.If Mommy's hands are full, I must be carried.If Mommy is in a hurry and wants to carry me, I must walk alone.If it is paper, it must be torn.If it has buttons, they must be pressed.If the volume is low, it must go high.If it is toilet paper, it must be unrolled on the floor.If it is a drawer, it must be pulled upon.If it is a toothbrush, it must be inserted into my mouth.If it has a faucet, it must be turned on at full force.If it is a phone, I must talk to it.If it is a bug, it must be swallowed.If it doesn't stay on my spoon, it must be dropped on the floor.If it is not food, it must be tasted.If it IS food, it must not be tasted.If it is dry, it must be made wet with drool, milk, or toilet water.If it is a car seat, it must be protested with arched back.If it is Mommy, it must be hugged. 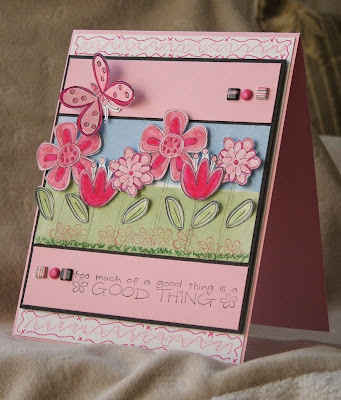 this is my card for the SC151 I used pretty in pink basic black and WW I also used bashful blue and celery the stamp set is to much of a good thing and all the flowers leaves and butterfly are popped up I hope you like!!!! 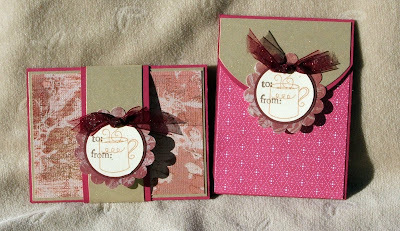 so many people have asked for the how to on the gift cards that I have been making and that makes me happy I love it when I make something that others also want to make!! So here we go. 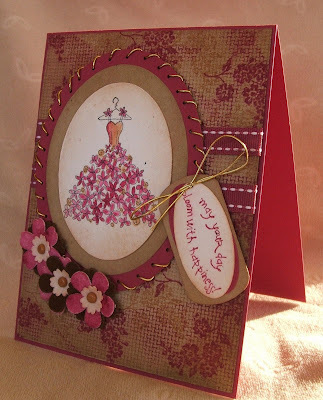 the base of the card is a very simple 4"x6" and it is scored at 3"
the gift card insert is 4" x 2 1/2" I scored 1/8" on both sides and one the bottom. make sure you cut the remaining squares left over in both corner's out you don't need them. 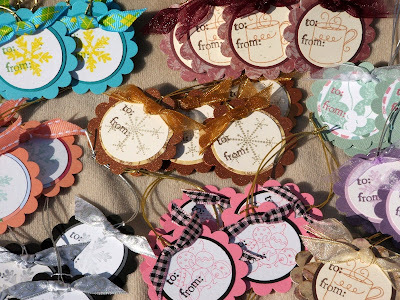 before you fold all of your scored sides in find your center at 2" make a tiny mark and with your 1 1/4" circle punch cut out the notch it makes it so much easier to get the gift card out. then fold the sides first then the bottom it makes a much cleaner look. 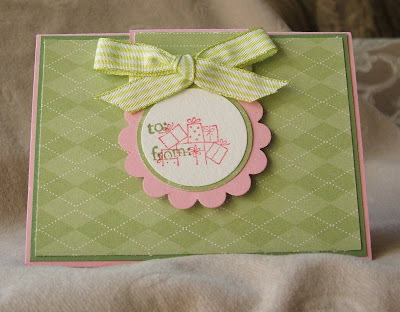 sticky strips work the best to hold your insert in the card but just use what you have!!!!!! 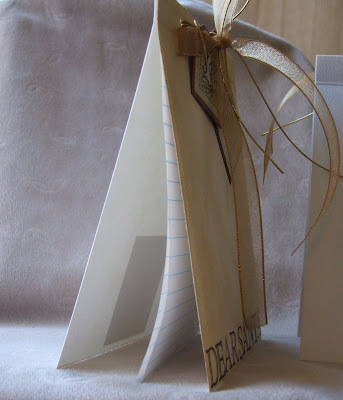 go ahead and mat and stamp the card how ever you want then it is time to do the belly band. 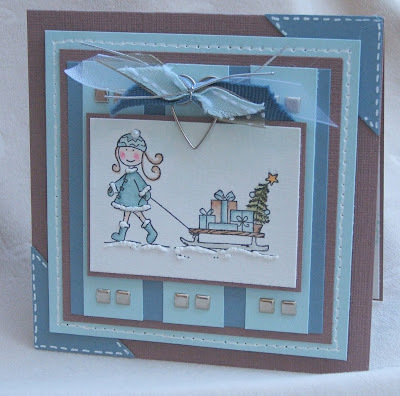 you will need a 1 1/2" x 7" strip of CS you can layer if you want the score lines need to be at 1/16" under 2" on both sides then you glue the center to the back of your card chose what ever decorative closure you would like to use I used my SU scalloped punch and two circle punches. glue the top half of the closure to the top part of the belly band and then on the under side were the closer and the band over lap add your Velcro closure then do the same on the bottom part of the band!!! 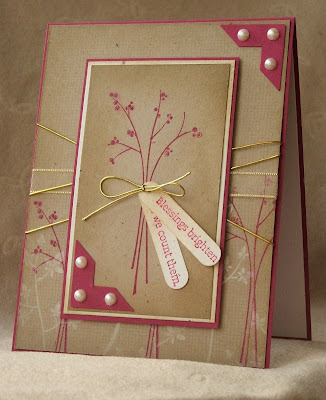 then this card is done!!!!! I hope you cane under stand my directions this is the first time I have done this for y'all!!!! 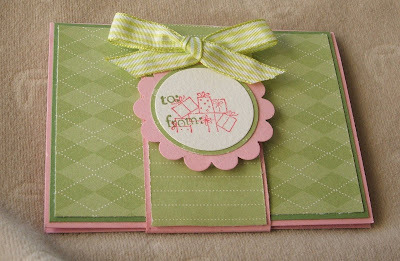 On this card there is no belly band and it is cut just a little different but when finished they are the same size!!! !the base for this one is 3" x 10" and scored at 3 1/2" and 2 /12" from ether end use what ever circle cutting system you my have to round the top and decorate how you see fit!!!! the inside is just a tiny different as well!! 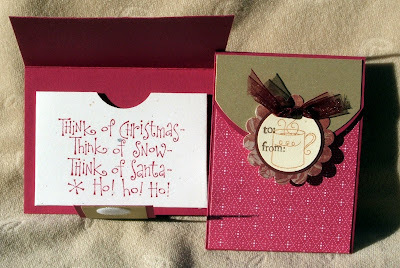 the insert in this card is 3" x 5/8" scored at 1/8" on both sides and the bottom!!! the rest is the same as the card on top!!! I would really like to see the gift card holders if you chose to use mine so leave me the link where I can view them in the comment section!!! well it sure has been a crazy week and it shows no sign of slowing down with doctors appts. and B-day party's I thought that I was never going to get to stamp again!!!! We also have thanksgiving to do and some more nesting (getting ready for little #4)!!! almost there and I can stamp to my little hearts content!!! I have had a hand full of people ask me about the measurement on the gift card holders in the post below this one and I will get thoughts on here no latter than tomorrow but I have used up every drop of free time that I had to day with that silly little card and I did add all the info over at SCS on this on so I have got to go for now!!! just know that I am starting to miss my everyday stamp time !!!!!! 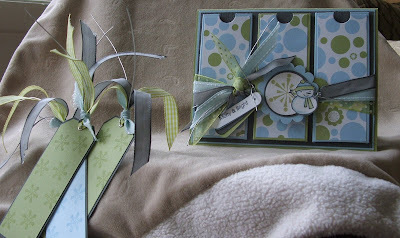 The other night I was laying in bed thinking about gift card holders, and that I wanted to make some. I did not want them to look the same as everybody else , now I don't know if I did that but I am happy with the turn out!! !I kind of just took mental notes on the size of the in side pocket but it was a lot of hit and miss. The out side how ever when folded 3x4 I am still working out the rest give me time and I will have full size details and pic of the how to!!!! This is the inside view nothing to jump up and down about, unless of cores there is a huge gift card in side that says go shopping it's on me........ 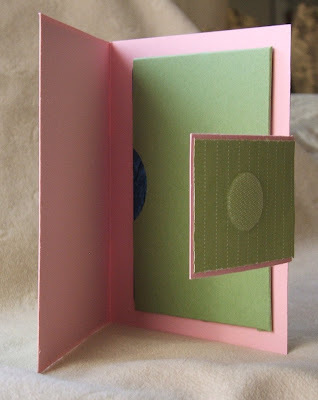 But there is nothing in this one just the inside of a card!!! All of the closures are Velcro dots I found at walmart!! Thanks for stopping by!!! I was not going to do the challenge today after being up all night with one sick kid, and the one growing at the speed of light inside of me making sleeping a total thing of the past!!! but then I saw the SC, and new the the little Elizybells girl that I had colored days ago, would fit like a charm. 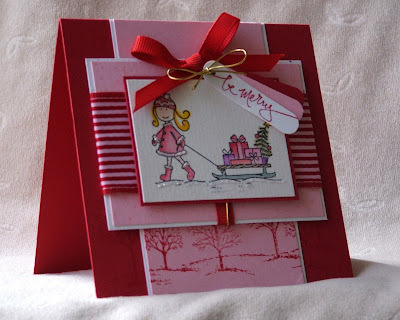 I also had been playing with that totally fab pink and red ribbon and that is were I got the colors for the card I had no DP that would go, so I used the trees hopping they would look good!!! this is one more Christmas cad to add to the pile. Thank for stopping by!!!! This may just be my new fav color combo. I don't think that there is anybody out there that would say that the colors here were not meant for each other!!! I did get up at 3am to see if the CC was posted yet I should also say that, was a really bad idea. because I could not go back to sleep!!! I try to blame it on the huge baby inside of me but really it is my over whelming argue to have ink and stamps in my hand all the time. so about the card I had 5 hours to think about while waiting for the alarm clock to go off!!! 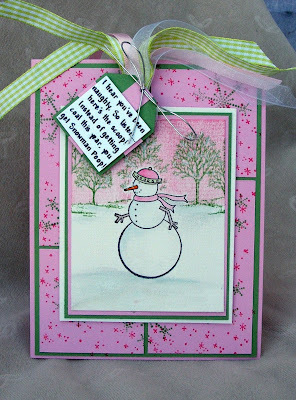 I thought that I would do another card for the CC to day. I am done now it looks like a pomegranate through-up all over me and my desk. I will just have to wait till tomorrow and do the SC!!! Well here they are. I had to take Ava to the doctor and it took FOREVER!!!! I was starving when I got there it took three hours for them to even call her name. 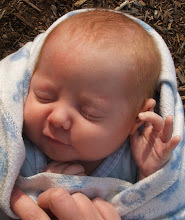 I was one grumpy mommy when daddy Finlay showed up to trade me places. so I am home now and here are the tag I said I I would post!!!!! 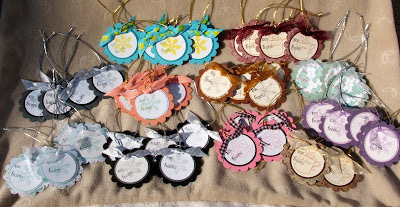 there are 55 of them and I did not cut even one piece of new card stock to make any of them, every bit of the paper came from my scrap box this is just one more way I have found to lighten that box up a little!!! I am so happy with them you would never know that they all were once called scraps some just shy of the trash but saved anyways. All of them are punched out with the SU scalloped punch and to circle punches. 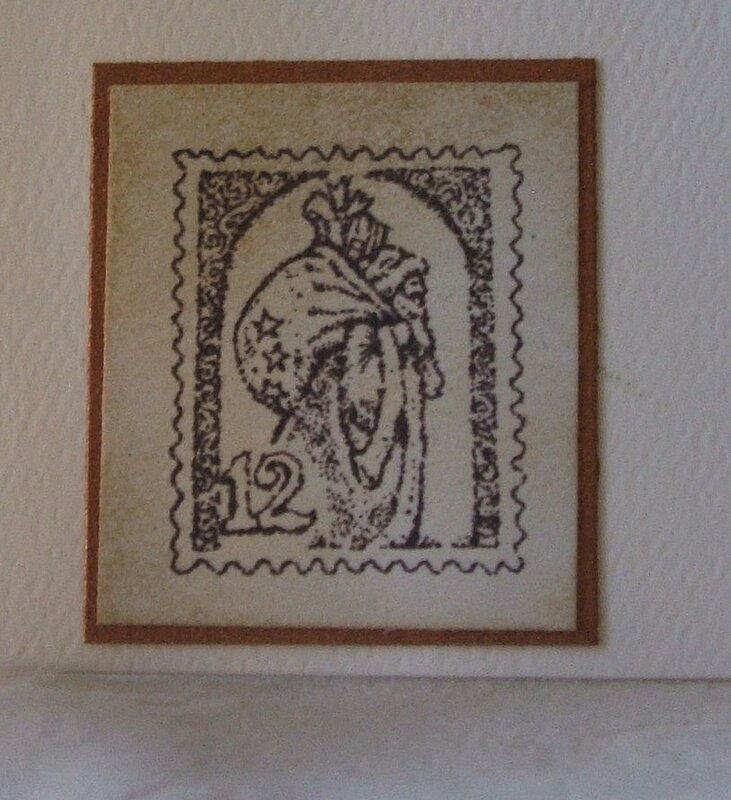 They all have a lighter image stamp covered by the darker to from stamp. I added the ribbon and cord to finish them off and called them done!!! I think they will come in handy of Christmas!!! 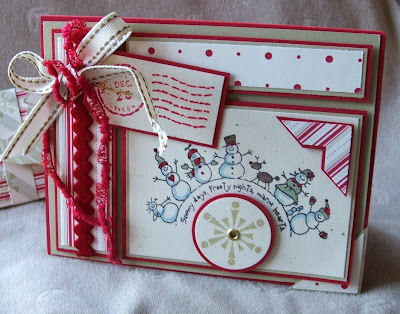 # 47 Cat over at cats creations http://catscreativeplace.blogspot.com/ go see her blog!!!! Thank you so much for playing along!!! Okay so the reason I ask what your thoughts on caseing was is because there in recent weeks has been two of my cards cased and I was so thrilled till I read about the card and me being a big over emotional prago was crushed that my name wasn't even in the small print one of the cards was one of my personal faves!!! 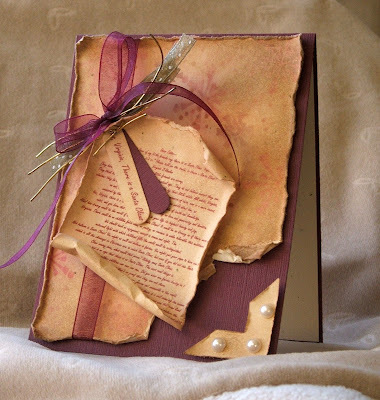 I have cased in the past that is how we learn and get ideas but I never put the person with the creative mind out!! As a matter of fact I want them to know that I loved there work enough that I could put my own take on it!!! So I want to say thank you for everybody great comments and thank you to thoughts who like my work well enough to make it there own but please don't forget to mention that the work is not entirely yours even if you have forgotten where the idea came from!!!! this picture is so much better than the one I put on SCS I tried to change it there but I don't know if it worked we will have to see. In this pic you can see the colors and little details that were hiding in the last pic like the paper piercing. You can also see the ribbon much better and that was my fav part so I hope you like it!!!! I made this card for todays CC139 And I had a great time doing it, it has been days sence I have just been able to play!!! I found the killer sketch here http://moralia.wordpress.com/ you should stop by and check out the rest of her blog!!! 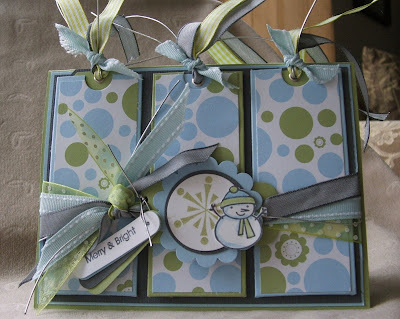 I had got myself some new ribbon yesterday at big lots and just hat to use some so that is why there is so much of it I was in a huge ribbon mood today!!! the snow is done with stickles my fave stuff ever and I am almost out if any one out there would like to take note and tell my DH (Christmas is coming up the man has no clue what to cet me even if I tell him)!! 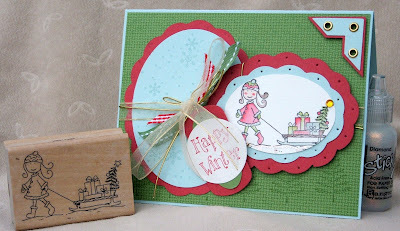 I dug out a lot of stamps for this card, Happy Winter, Merry and bright, Aida cloth, and my super cute new Elzibell stamp that my new stamp'n Friend Nancy Morgan got for me(ncmorgan on SCS)!!! 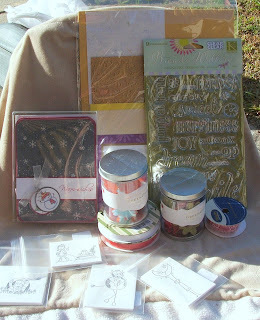 http://papersmiles.blogspot.com/ there is the link to her blog she rocks!!! 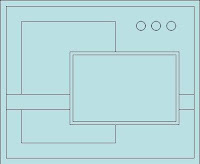 I wanted to do this when my blog it 5000 and I wanted to brake the bank doing it but when I did hit the big 5000 the craft fund was already in sad shape so it had to wait till now almost 1500 hits later and I cant wait!!!! So lets start giving some stuff away! All you have to do is tell me what you think about caseing the beautiful cards on SCS and the some times rare but dose happen cases that go with out credit. How would it make you feel and how would you handle it!!! 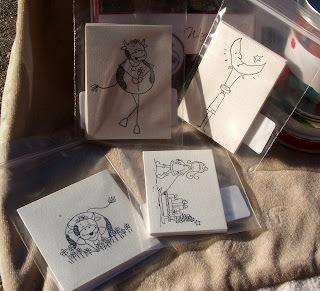 lets see what we have for ya'll here the picture above is some of the cutest images ever and I just felt the need to share them there is ten of each image all stamped in jet black on watercolor paper!!! This is a set of five Christmas cards that I made and they are my fave of all that I made this year so again I want to share!!!! 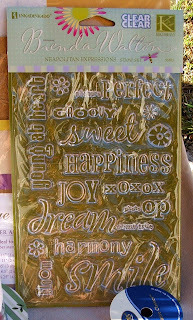 and this set of K&co clear stamps, I have also included 3 different ribbons and some hand made paper pack!!!! hope you enjoy the candy game with me and I can't wait to see what you have to say!!!! I will pic a winner on monday onw week from today!!! 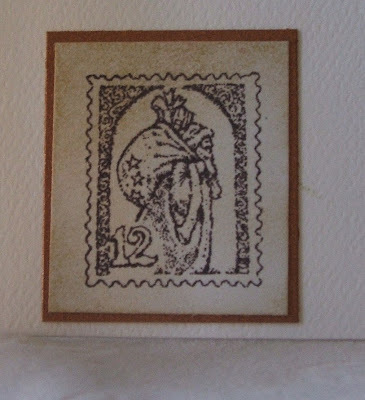 I had hosted a swap with some Lady's from my Yahoo group and on of the a rock'n stamper and very nice lady that I have yet to meat in person sent me this stamp the, the cutest little thing ever!!! 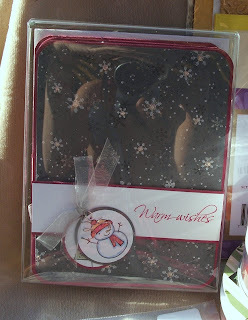 I was so happy when I found it in the package that I almost for got to look at the cards!!! They were the bomb!!! 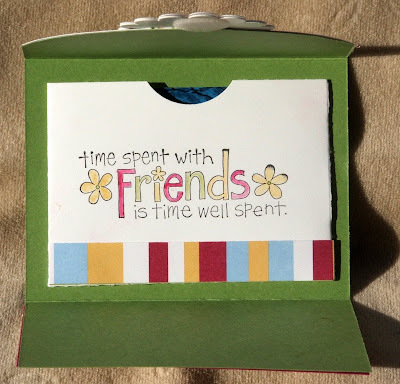 So Thank you Nancy (ncmorgan on SCS) and her blog paper smiles found here http://papersmiles.blogspot.com/ I will be sending this card with her swaps I am just waiting on the last swapper's cards to get them sent off!! 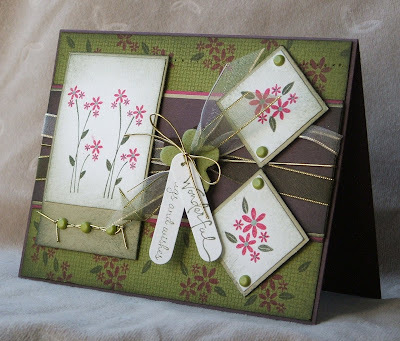 As for the FS39 I loved the colors she used and I now have the stamp so I picked this card http://www.splitcoaststampers.com/gallery/photo/707137?cat=500&ppuser=71474 other than thatr every thing is chanced thanks for looking!! !